This story has everything I’ve repeatedly warned you about: hundreds of illegal aliens infiltrating our country, Somalian Muslims (who’ve perpetrated a huge crime wave on America), an Islamic terrorist group that has murdered and otherwise tortured thousands in Somalia, and a prison convert to Islam. Everything that’s bad for America, that is. Read the Rest of the Agent Eyre’s Affidavit below . 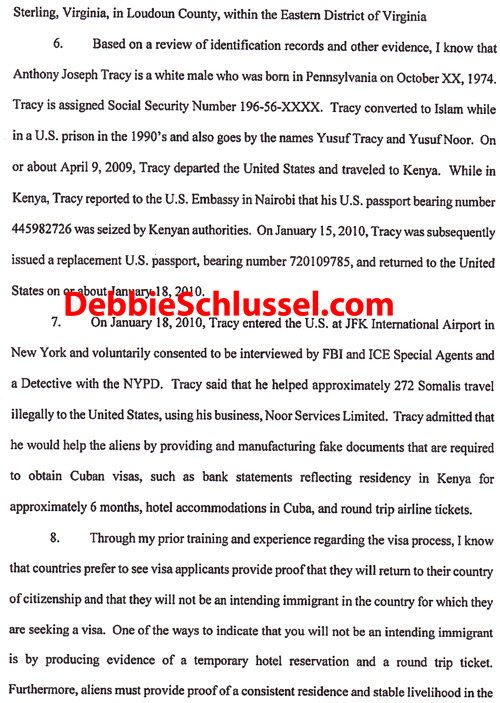 . .
Anthony Joseph Tracy a/k/a Yusuf Tracy a/k/a Yusuf Noor (strangely none of the press reports use his Muslim names–why?) sold out America, after converting to Islam in prison in the 1990s. 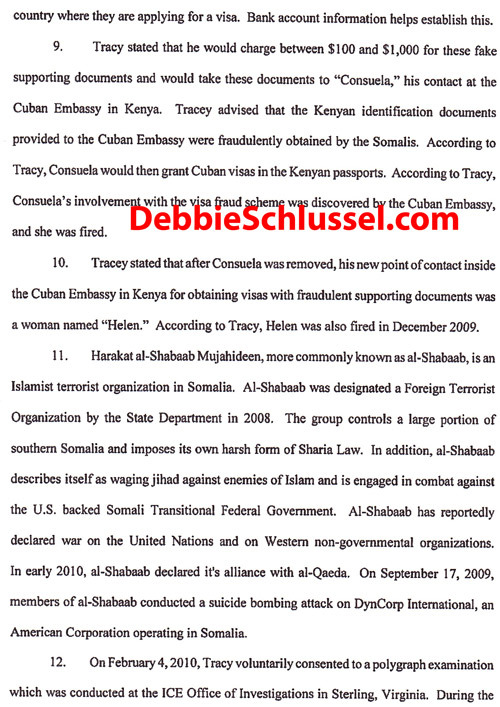 Then, he went to Somalia, made contact with Harakat Al-Shabaab Mujahideen a/k/a Al-Shabaab, the Somalian chapter of Al Qaeda, and helped the group smuggle in 270 Somali Muslims–likely all Islamic terrorists–into America. And I’m sure he isn’t the only one doing this. Just the only we’ve caught. Sadly, we haven’t caught a single one of the 270 Al-Shabaab Somalis who now live ALL OVER AMERICA! Well, no wonder there’s a Somali Muslim crime wave nationwide. The 270 Al-Shabaabis live in Minnesota, New York, Arizona, Washington State, Tennessee, and North Carolina, all places where Somali Muslims have engaged in many violent crimes. As I said, now we know why . . . and who they are. Now, where the heck are they? 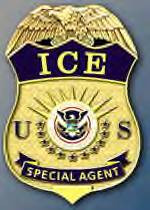 Some reports say that Immigration and Customs Enforcement (ICE) is looking for the 270 Somalians, but has yet to find a single one. Yay, America. Double Yay, Janet Napolitano. Yes, the Homeland is “Secure” . . . especially now that she’s we’ve had all those pandering meetings with Muslims. A traitor, in other words. I wouldn’t have been as kind to him as Thomas Eyre has been. We’re just too soft on those who seek to harm our country. WAKE THE HECK UP, AMERICA! Can anyone guess why the feds picked Minneapolis to drop so many Somalis (and Hmongs) into? Catch them you say???? Why , that would be …..racist. Not to mention , a threat to diversity. To ‘DS_ROCKS!’ – I think I can sum the answer up in two words: Keith Ellison. It’s worse than the 30s and 40s. Then, all we had to worry about was Communist penetration of the Government and subversion of our laws. Now it is both the leftists and the Muslims, and they reinforce each other. They probably know where some of them are & just don’t care, or else they’re waiting until one of Holder’s friends is ready to defend them, with Justice going along and not trying to win. And none of these elites cares what happens to average people like us. In islam, the Real Original and True Allah can not exists. In islam, the Real Original and True Allah can not have life. In islam, allah have no sprit. Conclusion, and the conclusion are the real revelation of muhammad. in islam, allah was murdered. In islam, only satan exists. Just outside of islam, the life, the true, the good Divine and good spiritual world of the ideas can exists. I always thought we should’ve wiped out Somalia after the conflict portrayed in the book and movie, “Blackhawk Down” . I also thought that we should’ve been using more nukes in our foreign policy. Thugs only respect force. Not the threat of force or bribes. Here we have MORE enemy muslims, coming to America from Kenya. Just like our very own Buraq Hussein. Do you think that Eric (the Red) Holder will do SQUAT about this. These Kenyan fascist muslimes all might be relatives of Barry Hussein. This is what happens when you listen to the shill “Rabbis for Obama” and vote in the Black Plague….anothe FINE Kenyan muslim. I wouldn’t lump Hmong and Muslims in the same category. I believe the Hmong came here as part of the benefits for fighting with us in the Vietnam war. One of the soldiers killed in the shooting at Ft. Hood, TX was a Hmong man whose family has a history of serving in the US armed forces. There’s also 535 domestic terrorists in a big building on Capitol Hill in DC. I read the Constitution, the best national security report I could find. Another great job by DS getting the truth, which the the main stream media will ignore, out to the public. Our elected officials continue to ignore what is happening and ever incumbent needs to be voted out of office. It is a very troubling time for our nation in so many ways. The federal government is taking control of every aspect of our lives while, neglecting the Constitutional duty to protect the citizens from force & fraud. I’m convinced that it is going to take attacks on U.S. soil to wake Americans up to the threat. Keep in mind the Dems/lib/progs want us to be just like Europe. I live outside of Columbus, Ohio now. I moved to my new place almost 6 months ago. I see more and more Muslims at the Meijer store close to where I live. There is a large Somalian population here also. I kid you not…it went from maybe 2 or 3 Muslims every now and then to me getting annoyed just the other day because I felt like I was in Dearbornistan again. And this burqa beeyotch was being so rude that I had to get out of there before I lost it. It is supposedly the heartland here, but things are changing. There has just been too much of a Muslim increase in this area not to wonder what the hell is going on. I see it, but unfortunately a lot of people do not pay attention to this or they just do not care. Hopefully more people will wake up, but I am beginning to think it is too late. You’re a disgrace. Ignorant filth. I hope to God you aren’t Jewish, it’s this kind of idiotic crap that gives us a bad name. You’re no better than the oppressors of the Jewish people of times past. Vile. These traitors need hanging in public to get the message across to their cohorts. They should be eliminated at all costs, any other means will cost us all– Not only in the terror that they inflict, but the legal fees, the prison costs ($50 – $70K per/yr) and the fact that they can infect the prison population with their mental virus. America needs to wake up… We are at war. These traitors need to be removed from this world and sent to whatever they deserve in the next life.